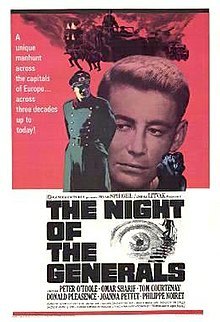 The Night of the Generals is a 1967 Franco-British-American Second World War crime mystery film directed by Anatole Litvak and produced by Sam Spiegel. It stars Peter O'Toole, Omar Sharif, Tom Courtenay, Donald Pleasence, Joanna Pettet and Philippe Noiret. The screenplay by Joseph Kessel and Paul Dehn was loosely based on the beginning of the novel of the same name by German author Hans Hellmut Kirst. The writing credits also include the line "based on an incident written by James Hadley Chase". Gore Vidal is said to have contributed to the screenplay, but was not credited. The musical score was composed by Maurice Jarre. Parts of this western-made film were shot on actual location in Warsaw, which at the time was behind the Iron Curtain because of the Cold War. The last scenes of the film were shot in Munich. The murder of a prostitute in German-occupied Warsaw in 1942 causes Abwehr Major Grau to start an investigation, as she was also a German agent. His evidence soon points to the killer being one of three German generals: General von Seidlitz-Gabler; General Kahlenberge, his chief of staff; or General Tanz. Grau's investigation is cut short by his summary transfer to Paris at the instigation of these officers. The case in Warsaw remains closed until all three officers meet in Paris in July 1944. Paris is then a hotbed of intrigue, with senior Wehrmacht officers plotting to assassinate Adolf Hitler. Kahlenberge is deeply involved in the plot, while von Seidlitz-Gabler is aware of its existence but is sitting on the fence, awaiting the outcome. Tanz is unaware of the plot and remains totally loyal to Hitler. On the night of 19 July 1944, Tanz orders his driver, Kurt Hartmann, to procure a prostitute; Tanz butchers her so as to implicate Hartmann, but offers Hartmann the chance to desert, which he accepts. When Grau, who is now a Lieutenant Colonel, learns of the murder, committed in the same manner as the first, he resumes his investigation and concludes that Tanz is the killer. However, his timing is unfortunate, because the very next day is the 20 July assassination attempt. While Grau is accusing Tanz face to face, word arrives that Hitler has survived, so Tanz kills Grau and labels him as one of the plot conspirators to cover his tracks. Jumping to 1965, the murder of a prostitute in Hamburg draws the attention of Interpol Inspector Morand, who owes a debt of gratitude to Grau for not revealing his connection to the French Resistance during the war. Almost certain there is a connection to Grau's 1942 case, Morand reopens the cold case, soon finding a link to the 1944 murder as well. Morand begins to tie up the loose ends: he finds no criminal activity from Kahlenberge or Seidlitz-Gabler, but learns of one man who knew which man is the real killer. Morand confronts Tanz, recently released after serving 20 years as a war criminal, at a reunion dinner for Tanz's former panzer division. When Morand produces Hartmann as his witness, Tanz goes into a vacant room and shoots himself. Both O'Toole and Sharif were hesitant to take on their roles for this film. Feeling they owed it to producer Sam Spiegel for making them international stars in Lawrence of Arabia, they did so anyway. ^ 2015 Twilight Time Blu-Ray Liner Notes by Julie Kirgo. This page was last edited on 31 January 2019, at 10:34 (UTC).